I have read more Star Wars books than I can count, having started with the X-wing series way back in middle school. I’ve certainly read the majority of what’s been published in the EU, but in recent years I really got more selective about what I read, because time is precious and a lot of the books are just…not good. So when the new “canon” Star Wars books were announced, I didn’t grab them right away. I waited to see if there would be anything worth my time. Turns out, I was waiting for Lost Stars. This book got solid reviews from people I trust, so I checked out the description. Star Wars, with a YA star-crossed romance bent? It’s like they made a book just for me! These characters will really grab you, especially our protagonists, Ciena Ree and Thane Kyrell, two childhood friends who end up on opposite sides of the galactic war. They feel so real and well-developed, but still have room to grow over the course of the book. As a writer myself, I felt like I was really learning a lot about the right way to breathe life into your characters. 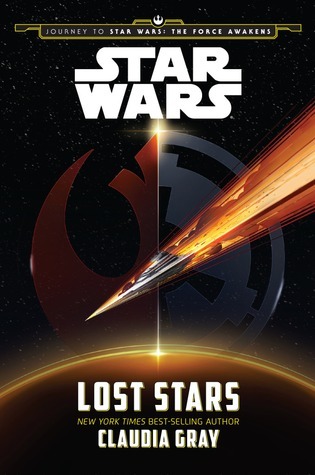 I also really liked that this book is about rank-and-file members of the Empire and Rebellion—no Jedi here. I know this book is billed as YA, but don’t let that deter you if it’s not your usual genre. It’s mostly due to the age of the characters, whom we see age from under 10 to mid-20s. And the romance angle, while important, is neither graphic nor omnipresent. The book is set mainly during the Original Trilogy, and it was pretty cool to see familiar characters like Tarkin and Wedge pop in. It was also cool to learn about some new places, like the protagonists’ homeworld of Jelucan. We also get a look at the battle of Jakku, and that Star Destroyer that’s buried there. But I have to say, as a long-time EU reader, it was really weird to not have any other familiar faces show up. No Zsinj or Isard picking up the pieces of the Empire. No Talon Karrde. No Tycho Celchu. It’s definitely something that will take some getting used to. You can read this book either before or after seeing The Force Awakens. I personally saw it while I was halfway through the book. I don’t think it matters much. The ending is a little bit open, I’m guessing partly because Gray didn’t want to write herself into a corner, not knowing how the main Star Wars story will continue after TFA. is the romance really not omnipresent? Romance in star wars novels is not a favorite of mine. They have to be really well done, like Luke and Mara Jade for me to stomach it. Or, not there at all, but referenced like in I, Jedi. Well, it’s pretty prevalent, but there’s a lot else going on, too. I thought this way done better than most of the YA stuff I read. I’d vote you give it a try. Lol callista! Forgot about her! Yeah that was weird. Part of the reason I loved Luke and Mara is because it took several books to progress and Mara was also a well developed character without him. She didn’t need Luke in order to have a story, if that makes any sense. Absolutely, that makes perfect sense and I totally agree. It’s like the “Mako Mori test,” where the female character has her own story arc, not related to the guy/romance.